The author contends American-born Blacks have gradually transformed from 'Africans living in America' into a 'new people' with different racial conceptualizations and global worldviews from their African ancestors. Other minority groups have benefitted from the sacrifices of African Americans – but without reciprocity of even sufficient acknowledgement of African Americans. 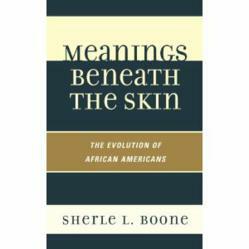 In his new book, Meanings Beneath the Skin: The Evolution of African Americans, psychology professor and African American scholar, Sherle Boone, argues the psychological make-up of African Americans is more closely aligned to White Americans than blacks originally from countries other than the United States. Research findings within Meanings Beneath the Skin: The Evolution of African Americans also suggest as African Americans increasingly embrace their distinctiveness, they may become more selective in rendering support on behalf of other non-white groups or nations. That is to say, African Americans may be more inclined to explore partnerships with other ethnic groups from the standpoint of collective self-interest. Sherle L. Boone is a Professor of Psychology at William Paterson University of New Jersey. He also is the founder and president of the W.E.B. DuBois Scholars Institute, Inc., housed on the campus of Princeton University. Meanings Beneath the Skin: The Evolution of African Americans is published by Rowman & Littlefield Publishers, Inc.